In Roulette, the dealer spins a wheel in one direction, then spins a ball in the opposite direction around a tilted circular track running around the circumference of the wheel. The ball eventually loses momentum and falls onto the wheel and into one of 38 colored and numbered pockets on the wheel. Players can continue to place bets as the ball spins around the wheel until the dealer announces no more bets or rien ne va plus. 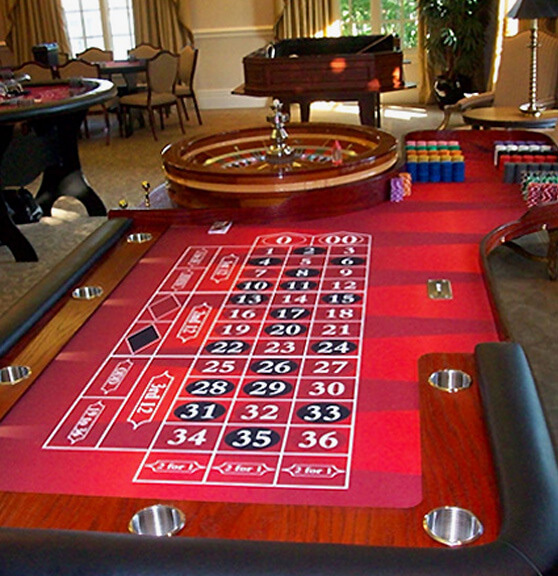 When a winning number and color is determined by the roulette wheel, the dealer will place a “dolly” or marker on that winning number on the roulette table layout. While the dolly is on the table, players may not place bets, collect bets, or remove any bets from the table. After placing the dolly, the dealer will sweep away all losing bets either by hand or rake, and determine all of the payouts to the remaining inside and outside winning bets. Payout is based on a bet’s probability of success. There are usually separate minimum and maximum bets for each player’s inside and outside bets for each spin. When the dealer is finished making payouts, he/she removes the marker from the board and players collect their winnings and make new bets. The winning chips remain on the board.